I was with the leader of one of the big UK based Christian charities recently and he commented to me that he was amazed about how openly we talk about how our church finances are going. I was surprised by that, although also a little embarrassed as we've not always managed to give updates as regularly I'd have liked. However, it also encouraged me to keep being as transparent as we can about everything in church life, not just or finances. 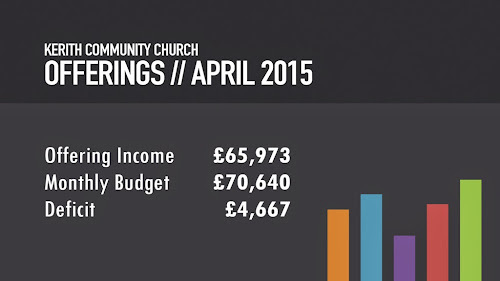 As you can see our April offerings were behind budget by a little under £5,000. 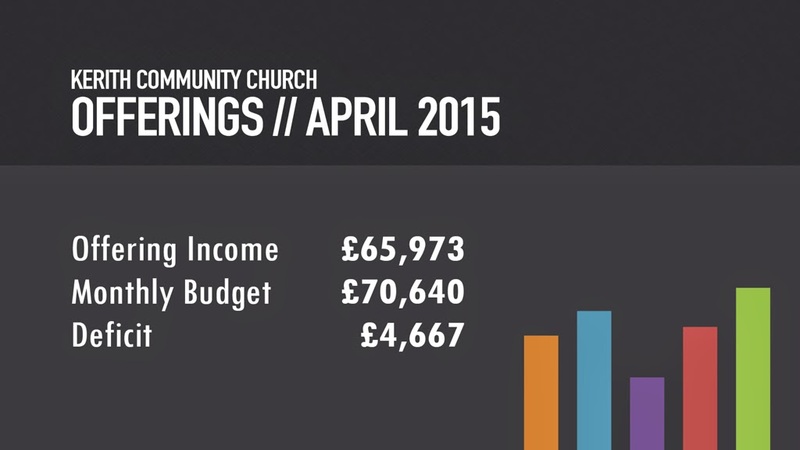 So this year we're just over £15,000 behind budget in terms of income. First I want to say a huge thank you to everyone who has given. 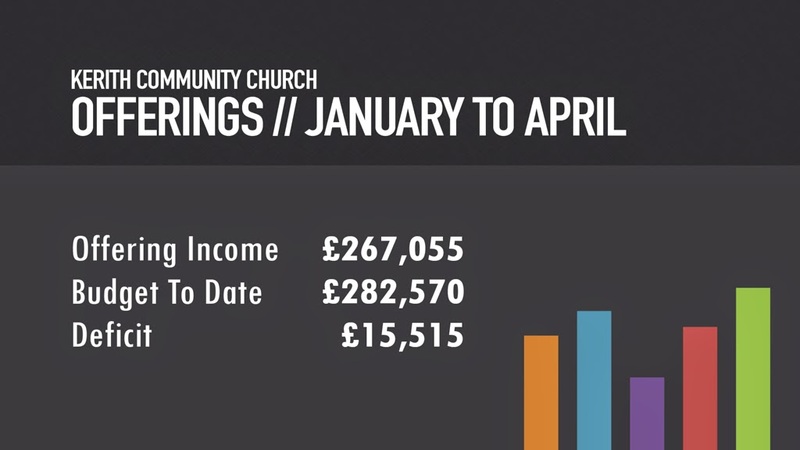 £267,000 is an amazing amount of money to come in, an amount which has allowed us to do so much. Just today I heard that at a TLG awards dinner last night (TLG is the education charity we partner with to help support children who are struggling in school) our Kerith team won an award, and one of the children we have been supporting won an award too - how cool is that! The first four months of this year have been packed with both local, national and international impact, from that young person being supported to succeed in school to us being involved in running a women's conference in Albania with around 400 women attending, all made possible by the money that's been given. It's important fo you to know that we're managing the deficit. Although income was below budget our expenditure was also below budget, the result of which is that our cash position (the money we have in reserves, and in the bank but not restricted in how we can spend it) has improved by around £2,000 since the start of the year. We'll continue to match our expenditure to income as the year goes on. However, if income does continue to be down that will mean there will be things we've planned to do this year which we won't be able to go ahead with. That could be anything from events we were planning, to equipment we were hoping to buy, to overseas trips we were planning to make. I'd therefore ask you to join me in praying that we'll quickly recover the deficit and get into surplus, and to prayerfully consider your own giving and whether God is calling you to get involved in helping make up the deficit. Above all let's remember that God is our provider, that we need have no anxiety, and that He promises to richly provide all our needs.